Last month, I had the privilege of gathering with about 60 other pastors from Michigan at our annual Pastors’ Institute. At this retreat for ministers in the Church of God, we learn from a guest speaker, we relax and play games together, and we share in times of worship as a community of faith. It is refreshing, in many ways, for pastors like me simply to be part of a worship service in which we have no responsibilities – other than to worship Jesus, which is always the responsibility of all of us. At our Tuesday night worship service, we were given a special opportunity to “speak” our praise in a unique and unusual way. Just before we shared the Lord’s Supper together, our leader asked us to take a moment to consider who Jesus is to us, to summarize (if that’s even possible) our relationship to Jesus in a word or two. Then we were invited to come forward, pick up a marker, and write those words on a dry-erase board. The result, which you can see here, was an amazing array of pictures, images, ideas about Jesus. Take a few minutes to read as many of these as you can. 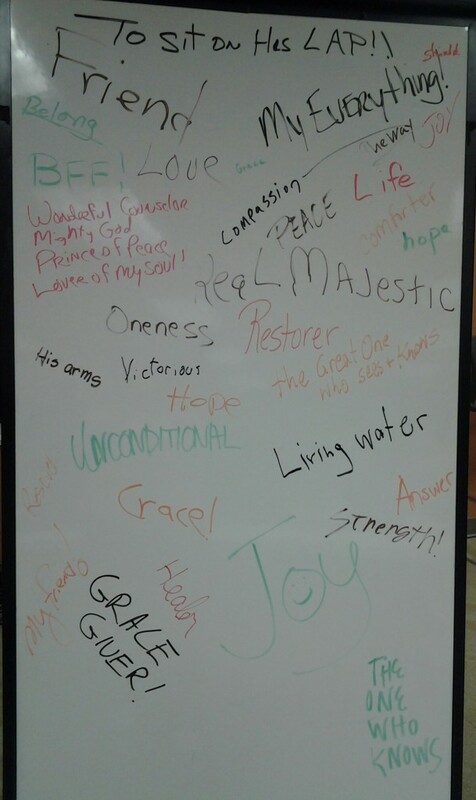 If you were to summarize your relationship with Jesus in one word, what word would you choose? My answer to that question was “Life,” which I wrote on the top right side of the board. In the past several months, I have experienced a growing understanding of Jesus as the source of my spiritual life. He is the one with whom I can connect on a daily basis in prayer, in silence, in contemplation, in breathing, in speaking, in listening, in sharing life with those around me. John 1:4 says, “in [Jesus] was life, and that life was the light of [all people].” Jesus is the source and destination of my life, my pilgrimage, my walk of discipleship. Even as we shared the Lord’s Supper that Tuesday evening, I was reminded that Jesus is the nourishment and sustenance for our journeys of faith; his body and blood, symbolized and represented in the bread and the cup, are food for our souls. This divine meal is a mystery, but it sheds light on the truth of Jesus as the giver of true, eternal, lasting light. Who is Jesus to you? How would you summarize his meaning for you today? I might pick a different word today than I did on that Tuesday evening. Your word or phrase might change from day to day, too, and that’s all right. We will never run out of ways to express who Jesus is, or his importance in our lives.